Double doors and garages doors give you plenty of room to get in and out of your structure, but ramps make it even easier! 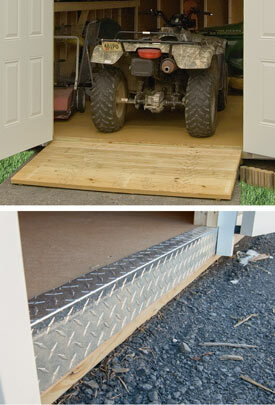 Pine Creek Structures offers ramps for all our standard size doors. Just lay it down, line it up with door, and drive right in. Ramps are the safe option if you or a family member has problems stepping up and down into the building. We recommend adding diamond tread plate all your building's entrance ways. The metal protects the edge of the floor from wear and tear of entering/exiting the building, especially if you're driving in lawn mowers, ATVs, snowmobiles, automobiles, or other equipment.